"Hey, sorry I haven't updated in a while. Life's been crazy, but I'll be back soon." I’ve been using Slic3r with my 3d printer, but wanted to be able to easily restore old configuration values, compare changes and so forth. Slic3r helpfully stores it’s configuration in INI files in the %appdata% directory, so the below batch script launches slic3r, and periodically git commits the configuration directory. While the batch is running, launching the batch again will start a new instance of Slic3r and then exit. Git must be installed, and available in the path. git -C "%configpath%" commit -a -m "Scheduled update"
I run this minimized (not completely hidden) by creating a shortcut to it, and setting the “Run” value to “Minimized” in the shortcut’s properties. Periodic Slic3r Settings Backup (in windows) was published on June 04, 2018 . I had a system crash which caused Tabletop Simulator to write an incomplete/corrupted autosave file, and lost about an hour of progress in a board game. Here’s a powershell script to rotate multiple copies of TTS’s TS_AutoSave.json. I now just run this via scheduled tasks every few minutes (TTS autosaves every 5 minutes if autosave is enabled). # will not try to process them. $sourceDir = "C:\Path\To\Documents\My Games\Tabletop Simulator\Saves"
$destinationDir = $sourceDir + "\Autosave"
# The total number of rotated backups to keep. $source = $sourceDir + "\TS_AutoSave.json"
$destination = $destinationDir + "\00.json"
$newName = "$destinationDir\$(($counter + 1).ToString('00')).json"
If you’re running linux or linux-like, logrotate will do a better job, but the Windows implementations are incomplete. Tabletop Simulator: Keep Multiple Autosaves was published on May 19, 2018 . 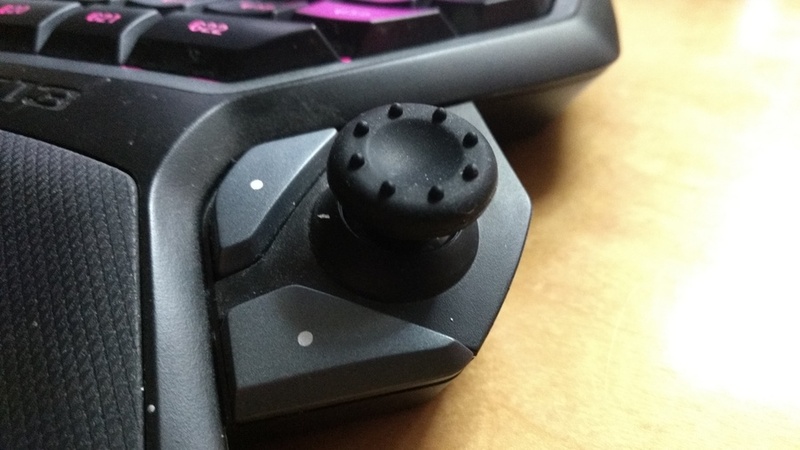 I’ve been using the Logitech G13 for a while, and like a lot of people, did not care for the tiny, pointy, thumbstick. 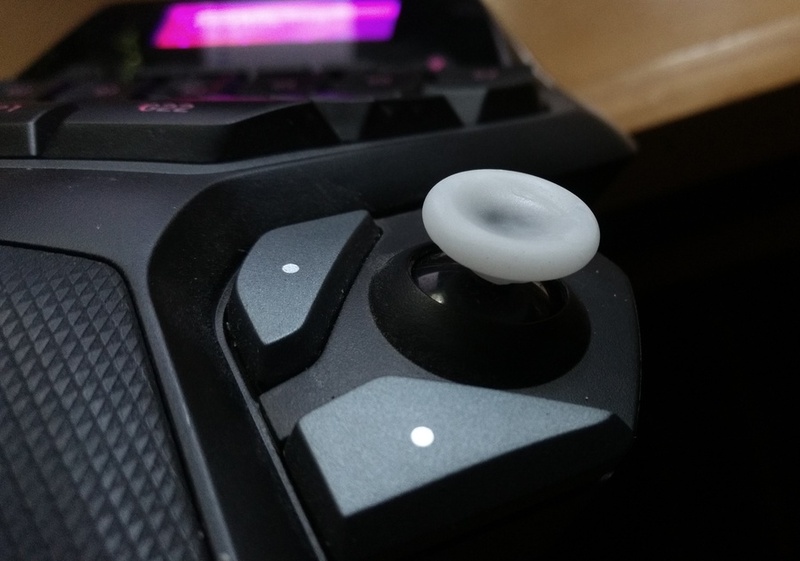 There are a lot of ways to fix this (like replacing the thumbstick with one from a more comfortable gamepad), but here’s what I settled on. Originally, I didn’t want to make any permanent modifications, so I packed a joystick cover full of sugru, and smooshed it on top of the existing joystick, and let it cure for a day. 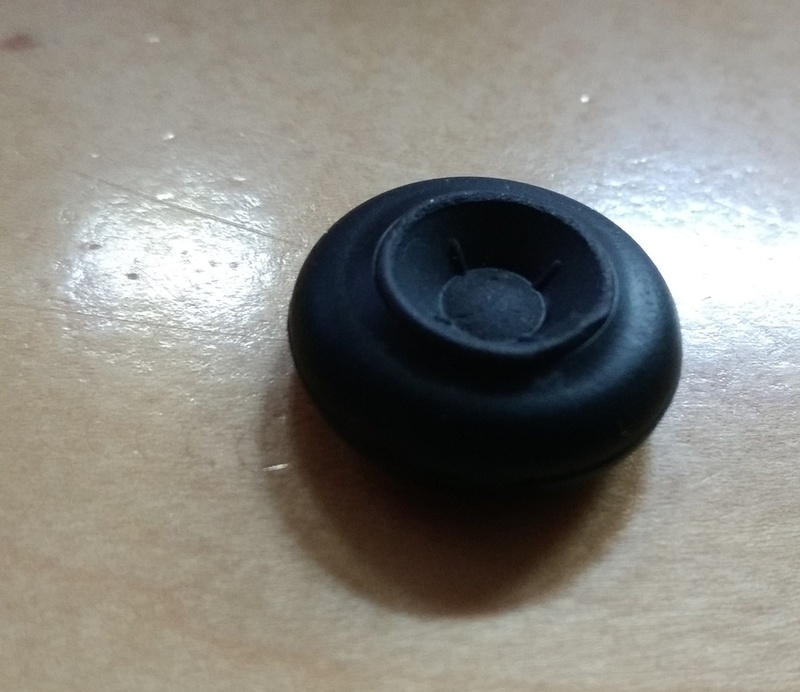 Because of the shape of the joystick cone, it couldn’t fit completely inside the cover, and rather than having sugru completely wrapping around the joystick top, it was only adhered to the top. Despite that, it lasted about 7 months under heavy use (enough to wear down the nubs on the cover) before falling off yesterday. Since I was out of sugru (and didn’t want to wait another 24 hours for it to cure anyway), I decided to use thermoplastic (instamorph, polymorph, etc.) instead. To allow it to fit in the cover and to adhere better, I removed the rubber tip from the G13. There doesn’t appear to be a good (read: reversible) way to do this, as mine was both glued, and too inflexible to pull off of plastic shaft without damage, so I just removed it with a craft knife. 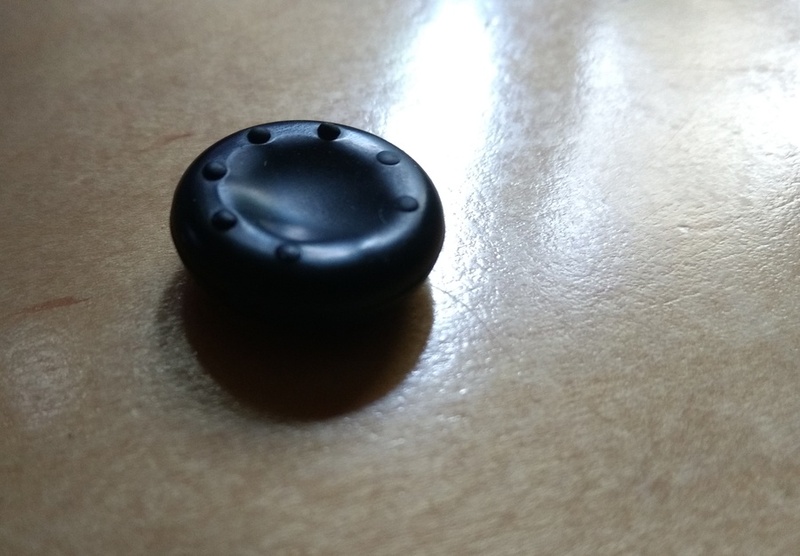 Like the sugru, I filled a new cover with thermoplastic, pushed it onto the joystick, and used a small pokey tool ensure that the thermoplastic wrapped around the top of the joystick (now flat), and let it cool. Here’s the thermoplastic, having been molded to the inside of the cover. Customizing the Logitech G13 was published on October 12, 2017 . I have sometimes wanted to run git bisect on all of the files in a single commit to determine which file caused a given issue. While this isn’t supported by git (for good reason), it’s easy enough to fake. This happened recently when I made a global typography change in a rails project, causing a feature spec (which depended on a specific string format) to fail. Git Bisecting Files in a Single Commit was published on November 30, 2016 . I’ve released Wheeler, an Open Broadcaster overlay. Wheeler is designed to replace pedal cams (sock cams) in racing games for streamers. It displays configurable racing wheel, pedal, shift and handbrake input and plays nicely with multiple input devices. Wheeler is priced at pay-what-you-want, but all support is appreciated. Wheeler Released was published on July 15, 2015 . The python script is also available as an all-in-one exe. You can download gauge.zip here. I started with X-Sim and this guide, but ran into a few problems. X-sim required Dirt’s extradata option to be set to 1, and didn’t seem to be aware of each cars rev limit. In the linked guide, the rev limit has been hardcoded to 9,500, which is pretty far off of some of DiRT Rally’s cars. The Use automatic maximum adjustment setting partially resolves this, but it won’t know what the maximum rpm until you reach it at least once. X-Sim is extremely flexible and powerful, but is very configuration-heavy and felt like overkill for this project. If you’re already using X-Sim to drive your sim rig/gauges, I’d recommend sticking with it. Additionally, if you’re interested in using this LED module for other games, including Assetto Corsa, iRacing, Project Cars and rFactor, check out http://batrako.blogspot.com/ instead. (optionally) Some jumper wires: dx.com $2.96. I just soldered wires directly to the arduino pins, but if you plan to reuse your nano for something else in the future, this may be a better solution. Install the Arduino software. Here is a helpful getting started guide: https://www.arduino.cc/en/Guide/Windows. Download the TM1638 library and extract the TM1638 directory to your Arduino library folder (ex: C:\Program Files\Arduino\libraries). Verify that you can upload sketches by uploading the blinky light Arduino example (see guide link). You will need to connect arduino pins to the LED module. One for ground, one for power, and 3 to control it. If you plan to daisy chain multiple modules, you’ll be using additional pins. Both the Arduino and the LED module pins are labeled on the PCB. Connect the Arduino 5v to the VCC input pin on the Arduino, connect ground to ground. I’ve wired Strobe 0, Clock and data to D3, D4 and D5 respectively. Wiring example from Prodigy in the x-sim forums. If the TM1638 library was installed correctly, you should have a TM1638 menu in the Arduino app under File > Examples. Upload the tm1638_one_module_example sketch to verify that you can communicate with the led module. You may need to update the data, clock and strobe pins used, depending on how you wired them together. Install this sketch on your Arduino. You may need to change the data, clock and strobe pin numbers, again depending on how you wired the led module up. Download the pygauge app, which will be responsible for passing telemetry data from DiRT Rally to the Arduino. Edit the included config.yml file, setting the host and port of DiRT Rally (likely 127.0.0.1 and 20777 if you’ve left everything default), and the COM port that your Arduino is connected to. Launch the gauge app (either run the exe, or python path/to/gauge.py). You should see the Arduino reset. That’s about it. Load up DiRT Rally, and you should see the LED module react once your stage starts. You may want to put the LED module in a project box of some kind. This will probably entail desoldering the ribbon cable connectors on the front of the module which stick out a fair bit. Install fancy racing button box buttons for the LED module. Add new features and submit a pull request! Update config.yml with your COM port, and dirt’s IP address and port. The $15 shift light and DiRT Rally was published on July 02, 2015 . I’ve released finalver, the versioning specification you’re probably already using. Finalver is most appropriate for assets that change hands and update regularly, codifying and standardizing one of the most popular1 versioning systems in active use today. It’s currently at version old.old.final, and moving toward version old.old.final-final soon. First finalver release! was published on July 01, 2015 . This is the obiligatory “I’ve update my blog, and I’m serious about adding regular content, guys. From here on, things will be different,” post. This site now sports the Minimal Mistakes jekyll theme and with it, better responsive support. Additionally, the site has a new vanity domain, a real and appropriate moniker (“Fail Fast”), more room for large images, and a marginally less grumpy author avatar. I still need to add a nice banner image and favicon, but it’s not pressing. I’m looking forward to the content I’ve been meaning to write. Fingers crossed. Blug Opdate was published on July 01, 2015 . Ran into an issue this weekend with httparty, and an API (mapquest) that was sensitive to query parameter order. Specifically, when batch geocoding locations, mapquest expects a query string like: ?location=foo&location=bar&location=baz, and will return geocode results in the order received. I noticed the issue when an api call for a US city returned a result in Ireland. differently. A sort was added at the end of the normalizer proc to ensure that the query string is consistent across versions, likely for testing. This works, but has the side effect of also shuffling the order of array value elements. or wait until it’s fixed upstream. Fun with Httparty and Query Order was published on October 21, 2013 . Received 3 Raspberry Pi cases as gifts recently, and my wife was kind enough to supply me with these excellent boxes. 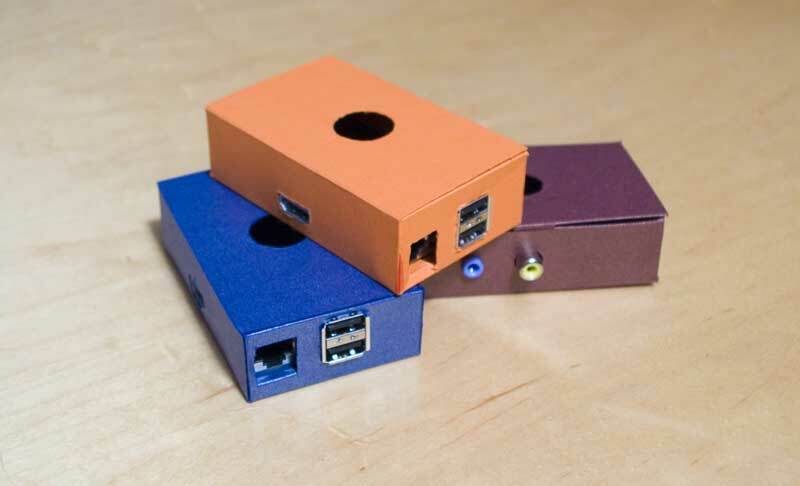 Raspberry Pi Paper Cases was published on July 10, 2013 . Copy Last Git Hash was published on July 02, 2013 . Recently discovered Chocolatey, which I’ll be using for basic software installation on new machines. Chocolatey both suffers and benefits from its community-driven packages. While there are a large number of packages available, especially compared to similar windows tools, several packages I tried are were not functioning and seem abandoned. My current install script and package lists can be found here. Windows Package Management with Chocolatey was published on June 22, 2013 . When running the setup_github_pages task, the ampersand in &hellip; can be escaped with a caret symbol. -    system "echo 'My Octopress Page is coming soon &hellip;' > index.html"
+    system "echo 'My Octopress Page is coming soon ^&hellip;' > index.html"
system "git commit -m \"Octopress init\""
Octopress Under Windows was published on June 19, 2013 . © 2018 Billiam. Powered by Jekyll using the Minimal Mistakes theme.